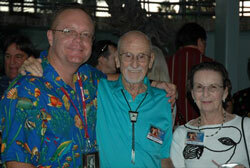 I was very happy to see Mr. Bauman and his wife at our reunion on Friday night. Thanks to Liz Barton for sending me this picture. I have had to travel in several spanish speaking foreign countries and the little bit I picked up thanks to this man has come in very handy. I told him I never became fluent in spanish and he said that was okay because he understands english. Mr. Bauman, you haven’t changed one little bit!